Ganga worked in education teaching English both at secondary school and university levels. There weren’t many options available when she was young and teaching profession was the one she stumbled into. It was a good choice since she is a people person and enjoyed working with children and young adults. Fortunately, it was a transportable skill that fitted in with her roving partner’s career path. Their work was mainly in developing countries around the world. Interacting with young people in these places was a special privilege. Reading, writing and travelling were three constants as they juggled careers, children and keeping in touch with both families across continents. Retirement has given Ganga the opportunity to try out things she never did before. These days she quilts, paints and is a much better cook than earlier! As a fond grandmother, storytelling and writing for children have been a natural progression. 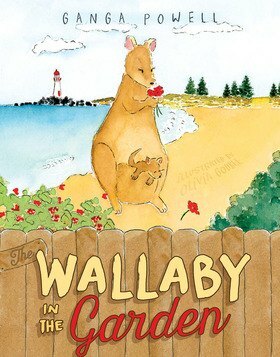 ‘The Wallaby in the Garden’ was inspired by the time a wallaby came by with her young joey and snacked on roses and geraniums. The wallaby still visits, but the flowers are now fenced off, so they live amicably together.